It's no secret that anime and manga are a big industry; while they may be something of a niche market in the United States, anime films regularly open at the top of the box office in Japan and manga publishers like Jump and Gangan are the country's equivalent of Marvel or DC. Even so, those who are obsessed with anime or manga are still often looked on as a little "strange," even in their country of origin. Branded "otaku" (which can also refer to obsessive nerds of any stripe), fans of anime and manga are perceived as socially awkward and disconnected from reality and as a result have an uneasy relationship with several creators in the industry such as Hayao Miyazaki, who recently said the quality of anime is declining due to an overabundance of otaku. Among the most controversial figures in the anime industry is Miyazaki's disciple director/writer Hideaki Anno. Best known for his seminal work Neon Genesis Evangelion, a mecha anime which both deconstructed the genre it was derived from while also simultaneously playing an enormous influence on later entries, Anno is also fairly (in)famous for his love-hate relationship with otaku culture. A long sufferer from depression and low self-esteem, Hideaki Anno has spoken several times in interviews about how he feels he wasted his youth obsessing over anime and tokusatsu (Japanese special-effects movies, like Godzilla) and as a result feels emotionally stunted. There is also a long-standing myth (which has been categorically denied by those involved with the film's production) that The End of Evangelion, the divisive film finale to the Evangelion TV series, was a none-too-subtle jab at anime fans. In 2002, Hideaki Anno married Moyoco Anno, a manga artist/writer well known in her own right for works such as Sugar Sugar Rune and Happy Mania. Considered one of the leading artist/writers of josei (adult women's manga), Ms. Anno is noted for her complex and independent-minded female characters as well as her unusual drawing style. The marriage of the two Annos (Hideaki calls them "Double Anno") has been a subject of interest to fans of both creators. Hideaki's extreme introversion and self-deprecating nature clashed somewhat with Moyoco's strong-willed and energetic personality and there was some speculation as to how the marriage would change both individuals and particularly Hideaki. It was perhaps for that reason that Moyoco decided to write Insufficient Direction, a collection of short manga vignettes detailing their life together during the early years of their marriage. Considerably different from her usual work in both art and style, Insufficient Direction takes several incidents from Moyoco's marriage to Hideaki and uses them (with some exaggeration and alteration) to poke fun at both her and her husband. At the same time, Insufficient Direction offers a commentary on the nature of the so-called "otaku lifestyle" which Hideaki, despite his (and Moyoco's) numerous complaints, continues to embody. 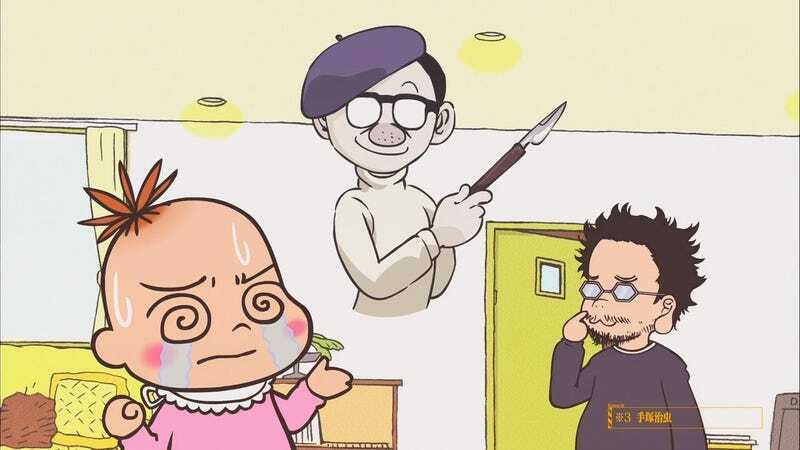 The manga stars caricatures of Hideaki and Moyoco, represented by "Director-kun" and "Rompers" respectively, and plots their wacky marital adventures as they gradually adjust to living together. The manga depicts both as somewhat childish—"kun" is a Japanese honorific most often used for young men or boys and "Rompers" draws herself as a baby—and they have their fair share of petty rows as they each struggle to maintain their own lifestyle, but it's clear that a lot of the teasing and criticism Moyoco directs toward her husband (and herself) is affectionate in nature and the manga has a loving core, despite its deprecating nature. I won't deny there is more than a little personal fascination on my part regarding the story of Double Anno's marriage. To a large extent, I identify with both Anno and his semi-avatar Shinji Ikari and particularly their struggle with depression and a desire to live up to the expectations of others. And I was more than a little curious to peer into the life of one of those creators I consider most influential to myself. So as soon as I discovered Insufficient Direction was available for sale within North America, I was determined to buy it. That being said, there's a lot to genuinely like about Insufficient Direction, which has a very wry sense of humor that's genuinely charming, even when it talks about such sordid details as Director-kun's struggle to obtain a quality stool sample. And for all her grumbling about her husband's otaku obsessions, Rompers gradually reveals herself as something of a closet otaku herself, just as Hideaki Anno, despite his publicly iconoclastic opinions about otaku culture, continues to embody that culture himself (a seeming contradiction he is aware of). As Rompers says herself, "in the end, [I] was an otaku too." There's also a genuine feeling of sweetness between the two Annos, which gives the manga a heartwarming feeling perhaps best embodied by its conclusion as well as Hideaki's own commentary, included in the bonus materials. Moyoco may tease her husband about his nerdy habits and his lack of interest in interior design and Hideaki may poke fun at Moyoco's tendency to put her foot in her mouth, but both obviously love one another in a very deep and appreciative way. In the end, both Director-kun and Rompers learn not only how to live with one another's differences in temperament, but also the joy in sharing those disparate interests with one another. At its core, Insufficient Direction is a story about love and nerddom and how the two needn't necessarily clash. Earlier in his life, Hideaki Anno said he felt his otaku nature had limited him personally and left him incapable of interacting naturally with others. To a certain extent, Moyoco seems to have shared a similar view of otaku, given her own self-admitted efforts to suppress her own otaku nature within herself. But the truth is more complex. While an overdeveloped obsession in all things nerdy can be debilitating (and perhaps was in Hideaki's early life), it needn't be in moderation. As Hideaki said in an interview a short while after his marriage, it's not so much that otaku need to "give up otaku-like things and become more suited to society." Rather, it's that "there are many other interesting things in the world, and we don't have to reject them." And so it seems both Annos have found the joy in each.